Le Massif in Eastern Canadian is super cool, owned and operated by the former Cirque du Soleil president and native to this area; Daniel Gauthier has invested heavily in the resort ($230 million). 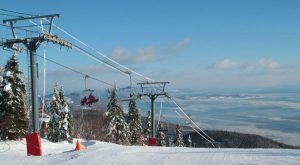 Le Massif is so unique, with the highest vertical east of the Canadian Rockies at 2,526-feet, spectacular views of the St. Lawrence River, and an upside down ski area – with the primary lodge and services at the summit. 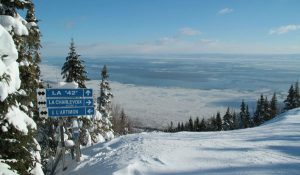 Le Massif ski resort is just 40 minutes from Quebec City and half hour from Mont Sainte Anne Ski Resort so you can make it part of your Eastern Canada ski holiday. 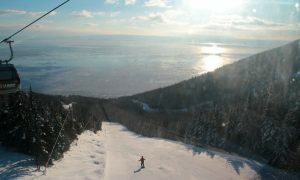 See Le Massif Ski Images. 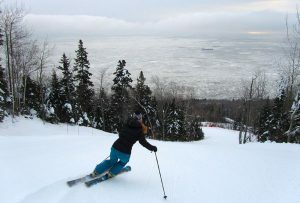 Le Massif’s ski and snowboard trails are well-pitched and picture perfect as they descend toward the St Lawrence Seaway. Interestingly, the views get better as you descend the trails, getting closer and closer to the dramatic ice chunked river at sea level below. Le Massif unique setting with two lodges – one at the base and one at the summit allows you to start your ski day at the top or bottom of the ski resort – but most services and the bigger parking areas are at the 2,645′ summit – which you drive to. For beginners, Le Massif has the special distinction of offering beginner terrain and a magic carpet at the summit, close to the summit lodge. This is where ski camp and lessons are offered as well. For advanced skiers, starting at the top is like the Kentucky Derby on weekends, as patrol drops the rope and the pack pushes off for first tracks down La Petite Riviere – their signature trail. Le Massif grooms many of their long trails, but leaves some natural allowing moguls to bump up- the French Canadians call them “les bosses,” and they are big on bump skiing. Le Massif is also the National Training Centre for the Canadian Ski Team, “La Charlevoix” trail provides exceptional terrain for World Cup and FIS Super G competitions. If you get the chance to ski Charlevoix, it is rarely open to the public, you will have new respect for the long, steep dramatic downhill course that racers endure. Interestingly, this race training hill was funded partly by the Canadian government and they built a mountaintop above the natural grade to achieve the necessary elevation and vertical to host Alpine Championships. Like Mt Fuji in Japan, its a manmade mountain on a mountain – quite a sight to see (by the sea). Finally Le Massif has added glades to their trail map, both on piste and off. Sous-bois is the French name for glades, and there are several located around the ski lifts and trails, plus a newly opened 99-acre territory far skiers’ left that is not patrolled and offers well-pitched, beautifully spaced birch, aspen and hardwoods accessed from Camp Boule or off La Coulee trail. Le Massif summit and base lodges are extraordinary from the incredible views of the St Lawrence Seaway to the haute cuisine served in the cafeteria. You won’t find greasy Fries or soda here, everything is fresh, chef made and delicious. Shrimp scampi risotto or wood fired pizza for lunch! Rodel! For alpine amusement beyond skiing and snowboarding, Le Massif has a 7.5 km sled run for rodeling (sledding on authentic alpine wooden sleds with runners) on a natural snow trail the full length of the ski resort’s vertical. This is an exciting family activity, takes about two hours from the cat ride to the top, training on how to maneuver your sled, and then a long run down a twisty trail with banked turns and bridges all the way to the base where you catch a gondola back up to the top. Call it La Luge, sledding or rodeling, this is a crazy ride, tons of fun, a little scary at times, but well worth the $35. Kids 12 and over can participate. Lodging at Le Massif for skiers is at the Hotel Germaine Charlevoix, in Baie-Saint-Paul, which opened in 2012. Hotel Charlevoix is Le Massif de Charlevoix’s newest hotel complex offering 145 rooms (classic, superior, lofts and dormitories) in five uniquely designed and decorated complexes. The Hotel was designed by Daniel Gauthier, the owner of Le Massif (formerly Cirque du Soliel), and it is amazing. Built in the location in Baie St Paul where the largest farm in Canada once stood (hence the name), this hotel is ultra modern but energy and earth conscious. The hospitality and homegrown cuisine are exceptional, the open concept kitchen at Les Labours is as fantastic as the chef’s local creations. And surprisingly the rates are not through the roof. There is even a dormitory style lodging for those on a budget with beds at $49 a night. We recommend the suites in the out buildings with views of the ice skating rink and in close proximity to the Spa where you can enjoy the most amazing outdoor hot tub looking out over the bay in the distance. A Train provides service to Le Massif from Québec City and La Malbaie, and to the Hotel Charlevoix. 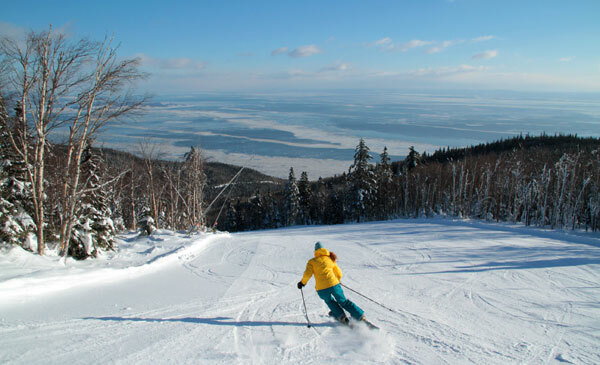 If you haven’t skied Quebec, you owe yourself a trip to Le Massif to discover the joie de vivre of the Charlevoix Region, the “oh la la” views of the St Lawrence, and the great skiing on Eastern Canada’s longest vertical!